NASA's Space Station Live! website and companion ISSLive! app allows users to see what the astronauts do minute by minute. June 21, 2012 — Ever wonder what the crew on board the International Space Station is doing right now? Or what is the temperature of each of the orbiting outpost's modules? Or how much power is being generated at this very instant by the space station's solar array wings? If so, NASA has an app for that. The agency's Space Station Live! website and companion ISSLive! mobile application offers the public a new inside look at what is happening aboard the International Space Station (ISS) and in the Mission Control Center at NASA's Johnson Space Center in Houston, Texas. Space Station Live! enables its users to see what the six expedition astronauts and cosmonauts on the complex are doing minute by minute. Streaming data from the station through Houston Mission Control lets the public view the latest details on temperatures, communications and power generation. The virtual ISS in Space Station Live! uses live streaming data to position the sun, Earth, moon and the station's solar arrays. In addition to accessing the same telemetry used by flight controllers, internet and smart phone users can use Space Station Live! 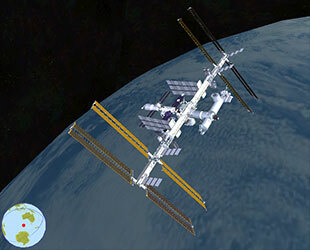 to tour the space station and mission control operator consoles through virtual 3-D view models. Space Station Live! is at spacestationlive.nasa.gov on the web and via the free ISSLive! app for smart phones and tablet computers linked from NASA's site. The app also is available through the Google Play and Apple iTunes app stores. On the website and through the mobile apps, users can navigate through a realistic 3-D recreation of the station's flight control room in Houston. They can navigate through the rows of consoles, selecting workstations such as the Flight Director's or Capcom's (spacecraft communicator) to see the type of live data they work with. Space Station Live! 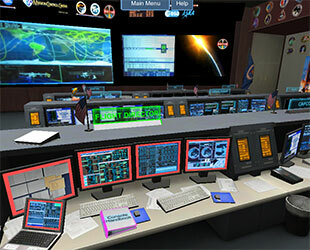 users can tour a virtual recreation of NASA's Mission Control Center and access live data on the consoles. For example, at the ETHOS console, which monitors the space station's life support systems, Space Station Live! users can view the current pressure, temperature and fan status in the U.S. Destiny laboratory and Tranquility node. For the Quest airlock, which astronauts exit through when performing spacewalks, live telemetry offers updates on the pressure and valve positions for the port's oxygen and nitrogen tanks. Similarly, at the SPARTAN or Station Power, Articulation and Thermal Control console, users can see the flow rate for the two ammonia-filled loops that cool the station. A different screen at the same virtual workstation displays the position in degrees and how many volts and amps are being generated by the power-providing solar arrays. Separate from the Mission Control views, Space Station Live! users can access the science and work timelines for each of the six crew members living on board, as well as see where the space station is in orbit, as relative to the real positions of the Earth, moon and Sun. 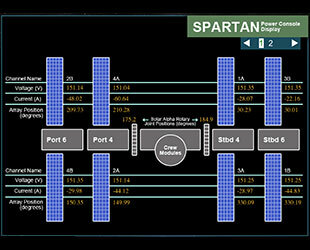 A sample screen at the SPARTAN console displays the position and power being generated by the station's solar arrays. More than a year in development, Space Station Live! and ISSLive! grew out an effort to provide the space station's flight controllers working in Mission Control access to the data they monitor while away from their workstations. NASA realized that sharing similar access to some of that same live data could help raise public awareness of the "groundbreaking research and technology development work... going on every day in the microgravity environment of space." Further, says NASA, the data can be useful as a teaching tool in the classroom. "Students and teachers can use the data to solve classroom problems in science, technology, engineering and mathematics," NASA wrote in its release announcing Space Station Live! as now being available. The Space Station Live! website first debuted last October as part of a public beta, or testing, period. The ISSLive! apps for Google Android and Apple iOS mobile devices were first released in March. "ISSLive! is a 'one-stop shop' for ISS data, letting users in on the fascinating activities that happen daily on board the ISS," the Apple App Store description for ISSLive! reads. 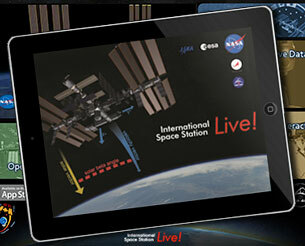 Visit NASA's Space Station Live! website or download the ISSLive! mobile app for Android or iOS mobile devices.